Inspired by the animated Disney film Lilo & Stitch, this CD includes songs performed by an eclectic collection of artists from Annette Funicello to Jessica Simpson. Harry Nilsson's "Coconut" joins classics such as Harry Belafonte's "Island In The Sun" and Elvis's "Blue Hawaii." Fun for kids of all ages, this CD is no longer being produced. But you can still find copies at Amazon.com and eBay. 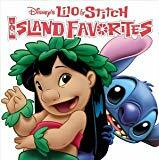 In 2005, Disney released a new version of the CD titled Lilo & Stitch 2: Island Favorites. The new CD has a slightly different line-up of tracks (without Nilsson's "Coconut").